Over 30 years experience in the Industry. Impeccable installations. Professional training. Many Long Island and Hamptons-area referrals upon request. Canine Control Company – Leaders in the electronic, underground-wire, pet-containment Industry. Don’t make your pet into a criminal, free them with a fence that is INVISIBLE. The Portable Indoor Pet Barrier Solutions Unit can be discretely placed outdoors in flowerbeds or gardens to prevent digging or destroying foliage. The Unit can also safely keep your pet away from garbage cans or dangerous areas. 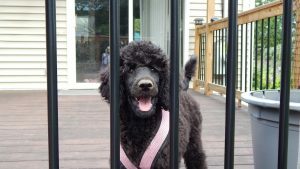 Out Pet Containment Solutions will keep your pet safely on your property. And our other behavior solutions can even prevent them from barking at inappropriate times.